India has achieved huge successes in both football and hockey during its early years but later on it has only been a continuous downfall. The condition of these sports can be viewed from the perspectives of the various stakeholders. The role of the various leagues in the betterment of these sports can be studied and compared with similar international systems in order to recommend some improvements to the present state of affairs. The fate of Indian sports of late has been riding on the good fortune and patchy performance of the Indian cricket team that has gained tremendous commercial importance in the Indian business landscape. Although, frauds such as match fixing have marred the sport in the recent past, the money still flows in. A major factor for this amazing story is the interest of the crowds in the gentleman's game. But is cricket the be-all and end-all of sport? Definitely not! We started off great in football and we have experienced unbelievable success at hockey in the past. The national sport might as well have been the love of the billion-strong cricket hungry nation. Is the worst over for hockey and football? We must teach them (the Germans) a lesson in ball control. India V/s Germany, Olympics, 1936: India was up by 6 goals at one point. Richard Allen came back after receiving first aid and playing barefoot, he instructed the team to go easy on the goals. As the stunned crowd watched, the Indians repeatedly took the ball up to the German circle and then back passed to mystify their opponents. India vanquished Germany 8-1 in the finals to win its third successive Olympic gold medal. Mohun Bagan V/s East Yorkshire, IFA Cup, 1911: Mohun Bagan's team comprising of 11 bare-footed amateur players beat 5 booted European military teams to lift IFA Cup. In 2008, for the first time in the history of Indian Hockey, Indian team failed to even qualify for the Olympics. Indian Football team stands at an abysmal 153rd rank in FIFA rankings out of 207 teams. For the first time in the history of Indian football an Indian team, the Mohun Bagan, consisting purely of Bengalees, has won the Indian Football Association Shield beating crack teams of English regiments. Even though there is a strong fan following for international football in India, the interest of Indian public in the domestic version of the game has been on a decline. FIFA was formed in 1904, comprising of associations from 7 countries. Football has been present for over a century in the country. India's oldest football tournament - The Durand Cup was started in 1888. But India's tryst with destiny in football began in July 29, 1911 when Mohun Bagan's bare-footed team beat East Yorkshire Regiment. It was the first ever victory of any Indian team over the British. The Governing body of football, AIFF came into being in 1937 & gained affiliation with FIFA in 1948. The years from 1950-62 was the Golden Era for India in football. We won gold medals in the 1951 and 1962 Asian Games. In the 1956 Melbourne Olympics India became the first Asian nation to reach the Olympic football semi-final. The different stages documenting the growth and decline of Indian football has been shown in Exhibit 1. Hockey is the national sport of India. International Hockey Federation (FIH) was formed in Paris in 1924 and the 1st Hockey association in India came into being in Bengal in 1908. India had won 6 consecutive Olympic gold medals in Hockey from 1928 to 1956. Since then India has won only 2 more Olympic gold medals. India had also won the Hockey world cup in 1975 but hasn't been even in the top 4 since then. India, the 1980 Olympic champion, was 3rd and 4th in the Champions Trophy in 1982 and 1983 respectively. Since then, India has only managed to come 4th on 4 occasions. 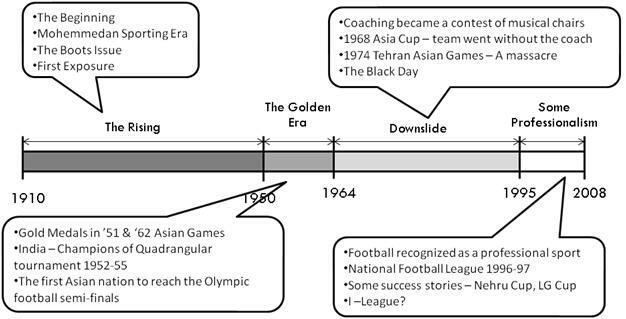 Exhibit 2 shows a timeline of Indian hockey. While hockey and football struggle to maintain a firm footing in the minds of the supporters, the other stakeholders have been pursuing their personal objectives at the expense of the games. An analysis of the role of the various stakeholders is presented below. Taking cricket as a benchmark to evaluate football and hockey exposes the lack of resource commitment that has led to the decline of hockey and football. For Cricket, the BCCI has pretty much been a shrewd CEO. Knowing where to look for funds, how to encash opportunities and how to build a strong team/brand. The astute management has lead the way for Cricket and played a major role in its success. For Cricket, the government has always been there. Whether it is the State Governments offering free houses for cricketers or the Central Government rewarding the players even when they failed to perform. Media has always kept its blessing hand on the head of Cricket, with separate TV channels becoming dedicated to a single sport. Pouring money into Cricket has been the biggest PR/ad campaigns for the corporate in the country. League Systems - A Straw for the Drowning Causes? Overall, when we look at the performance of Indian teams in both hockey and football post the time when leagues were introduced, we see some marginal improvement in the performance. However, there are a number of factors that have an influence on the team's show. Firstly, the selection of national team was not very coherently connected with the selection of club teams. Secondly, if we look at each and every particular case where India has done well in any of these two sports at an international level there seems to be some other hidden reason for that - sometimes it was due to a change of coach, some other times it was due to some star player or at some other times it was sheer luck. It was the first time that football was recognized as a professional sport with the start of the League. There was sponsorship and media coverage and also foreign players who were invited to play in the domestic clubs to help improve their performance. The League brought in some temporary success with the win at 1997 Nehru Cup and formation of first professional football club in the country - FC Kochin. But, this success was short lived as soon the problems with organization and marketing took the toll and sponsorship and media saw a withdrawal. The next generation of football league - The I-League may answer some of the questions which NFL failed to. The league attracted masses and media was able to generate some fizz but lost the momentum overtime. The main reasons for the same were that it was largely limited to regional pockets; it was never able to spread out and engage the whole of India. Also there were inherent issues with the system like the absence of private investment and absence of linkage with national team selection which did not bring about any changes in the state of the game. At the league level, more private investment should be encouraged and the sports should be marketed well. The clubs should be run as business entities in order to bring professionalism into the games and there should be built-in training & coaching to help grow talented youngsters. In order to improve the system we need to effect enhancements at three levels in the country's sporting hierarchy. At the national level, the selection process should be based on meritocracy and should be made transparent while poor administration and regional politics should be curtailed. At the league level, more private investment should be encouraged and the sports should be marketed well. The clubs should be run as business entities in order to bring professionalism into the games and there should be built-in training & coaching to help grow talented youngsters. At the Grassroots Level, leagues for junior levels need to be created to better nurture the talent like U-14, U-16, U-18 etc, and the sports should be marketed better as a career opportunity and rewards, incentives etc. should be increased to attract youngsters. In order to achieve these changes in the different levels, there are two approaches that can be chosen to drive sports towards a better future. Things need to happen at the lowest level and then flow up, i.e. there needs to be major changes at the school and college level to promote the sport, to attract more and more youngsters to play the game. A league system needs to be developed which acts as a medium for national team selection and for increasing the fan following. Thus, excitement is generated which would help improve the standard of the game so that there are better players selected for the national team. This will thus lead to an improvement in the way the national team performs. Create conditions and select the national team purely on meritocracy so that the performance improves. Provide them with facilities and infrastructure to improve their game. There should be recognition of achievements and provision of more rewards. Improvement in the national team's performance will lead to a greater fan following. This excitement around the sport then can be utilized to promote the league system and help in raising revenues through the right marketing efforts and advertising. The league can act as a tool to help selection committees select the national teams. Also, with the league in place and funds coming in, systems can be placed at the school and college level to promote the sport and increase participation. In order to improve the state of football and hockey in India, we recommend changing things simultaneously at all levels as against the sequential approach suggested by the Top-down approach but the engine to drive the change will have to be the performance of the national team. Thus, we need to generate excitement around the sport and the national team by getting them to perform better but we need to simultaneously start working on the league system to have competitions at each stage and level - Men, Women, Junior, School and College like U-18, U-16, U-14. The current state of affairs of Indian hockey and football is a story of mixed chances and collective apathy of various stakeholders involved. However, proper planning with long term vision can help to turn around things. In order to improve the state of football and hockey in India, we recommend changing things simultaneously at all levels as against the sequential approach suggested by the Top-down strategy but the engine to drive the change will have to be the performance of the national team. Thus, we need to generate excitement around the sport and the national team by getting them to perform better but we need to simultaneously start working on the league system to have competitions at each stage and level - Men, Women, Junior, School and College like U-18, U-16, U-14.